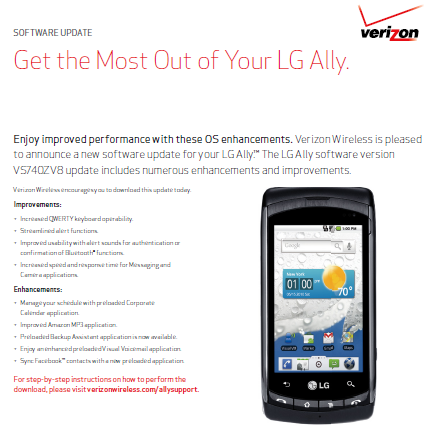 A few days ago it was revealed that Verizon would be finally updating the LG Ally to Android 2.2 Froyo. Now, less than a week later, users are reporting that the OTA update for Froyo has been pushed by Verizon. 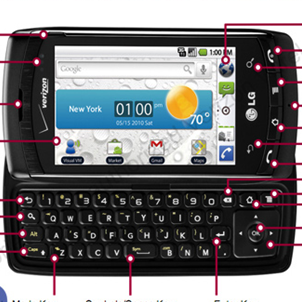 While it is laudable that Verizon is updating the mid-range LG Ally (unlike certain other manufacturers), Froyo is already an out-dated version of Android thanks to Gingerbread. Nevertheless, this latest update ought to bring some nice improvements to the device, while increasing the number of users running Froyo by just a little bit. 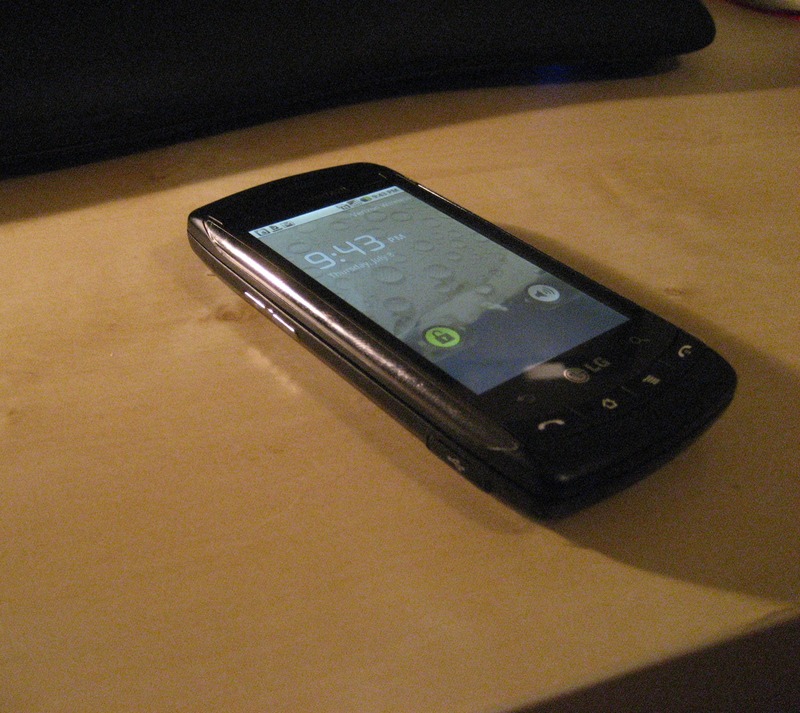 Motorola Droid - Affordable doesn’t necessarily have to mean cheap, and such is the case with the original Motorola Droid. The phone was set for release on May 20, but now it seems that release has been pushed back. 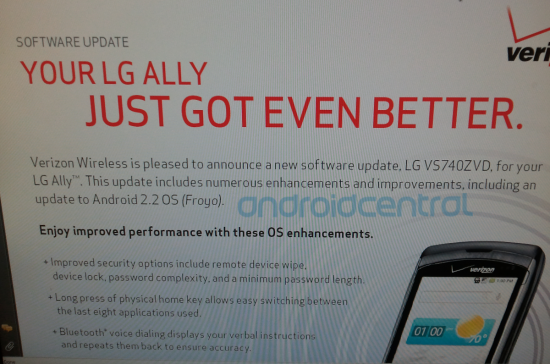 Boy Genius Report has released details about the upcoming LG Ally, which we now heavily associate with Iron Man 2, with a leaked document providing specs and release information ahead of the launch. 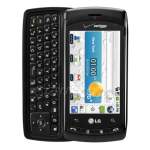 Catering for the low-end market, the Ally has a 600MHz processor and 256MB of RAM, and ships with Android 2.1. 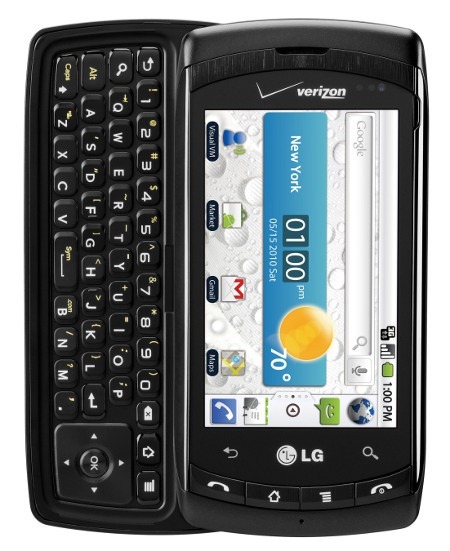 LG has also added their own touch to the phone with a custom theme. 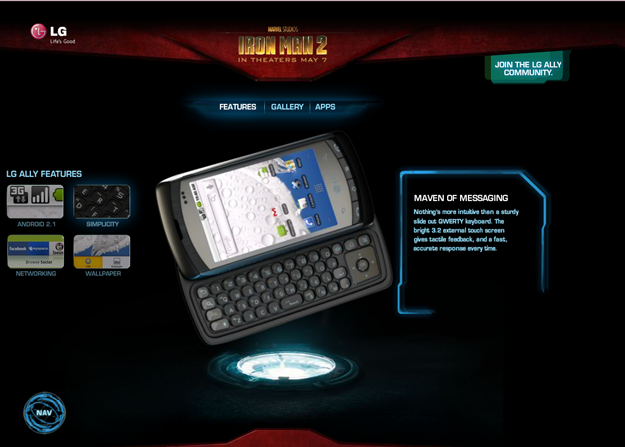 In order to promote the upcoming Iron Man 2 movie together with the LG Ally Android phone (which seems to be featured in a variety of scenes), LG yesterday launched a new Flash powered site called LGIM2.com. While the url spells out "Iron Man 2", quite a large portion of the site is actually dedicated to the Ally. In order to gain access to the part of the site where the phone is shown, you have to click on "Nav" at the bottom and then on "LG Ally", or just follow this direct link. You have to hand it to Verizon’s marketing department – out of all of the carriers pushing Android, their ads have been the most compelling. 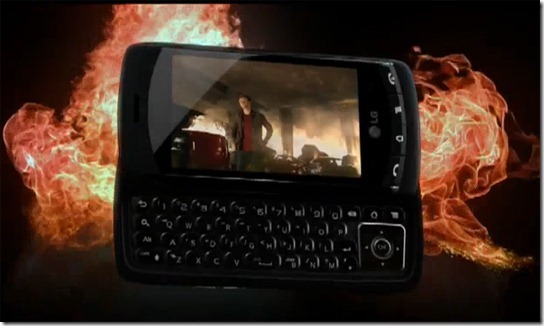 Verizon continues their Android advertising legacy with a departure from the ‘Droid Does’ campaign in order to use the Iron Man 2 release to pimp their latest Android phone – the LG Ally. What’s that? You haven’t heard of the Ally? 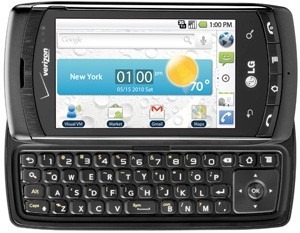 What about the LG Aloha?